G Street Revolution, a faculty-staff-student band, performs on campus to wrap up Arts Week. Some people have the idea that the arts are being shortchanged as UC Merced grows. The Global Arts, Media and Writing Studies (GAMWS) Program is here to correct that perception with its inaugural Arts Week, set for March 4-9. “We want to draw people to campus and show them what we are about and what we are doing,” ethnomusicology Professor Jayson Beaster-Jones said. Arts Week offers six days and evenings of events including workshops, music, lectures, an open-mic night, dance, writing, film and much more, involving students, faculty, staff and the community. 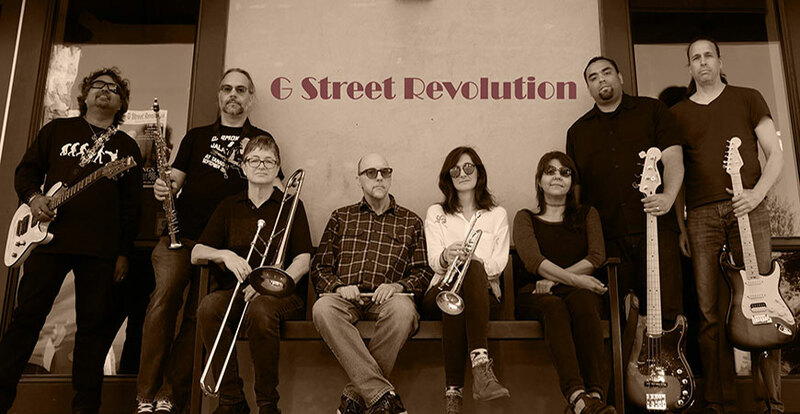 The week culminates with a writing Collaboratorium , a citywide jam session and a concert by the faculty rock band G Street Revolution. The band has been together for three years and plays both faculty functions and local public events. It’s as interdisciplinary as the campus is, with members from all three schools and various programs, including Beaster-Jones and music Professor Patricia Vergara from GAMWS, Paul Gibbons with writing studies, sociology Professor Nella Van Dyke, biology graduate student Kinsey Brock and management of complex systems Professor Tea Lempiälä, among others. The Collaboratorium is a day-long workshop for anyone interested in any form of writing, including script-writing, fiction and nonfiction, professional writing and even songwriting. Arts Week takes place in tandem with Research Week, the campus’s annual research showcase, and Beaster-Jones said the two complement each other well. “Our arts programs have been growing rapidly, and we have a lot of new faculty members who are doing very exciting work, including a documentary filmmaker who is looking at communities in Merced, and a community-based research project to record the oral histories of many of the immigrant communities that have settled here,” Beaster-Jones said. Arts Week also gives visitors an opportunity to see how well-rounded the campus is. Among those who have been specially invited: teachers and students from Merced’s public schools and Merced College. GAMWS often sponsors or produces events around town, sometimes with the Multicultural Arts Center. The program brings artists and exhibits, live music, film series, plays and other performances, guest speakers and cultural celebrations. There are two student-faculty musical ensembles affiliated with GAMWS, a Latin-American music group and a Swing Jazz combo that hosts dance nights and will perform at the Mariposa Jazz Festival in May — its first appearance there. The Swing-dance nights draw people from Fresno and Modesto as well as locally, Beaster-Jones said, because people love the chance to dance to live Swing music. Arts Week’s all-free events include an open-mic night hosted by the flourishing student group the Young Artist Movement; a workshop for writing and the arts; a student film screening; a Latin American drumming workshop; interactive art workshops; a Swing-dance workshop; the creative writing and arts Collaboratorium; and the jam session and concert. Parking will be free in the campus’s North Bowl parking lot after 6 p.m. for all events, and some will offer free food, as well. Saturday, March 9: Creative Writing and Arts Collaboratorium (all day in COB2); jam session (1-4 p.m.) and concert (4:30-6 p.m.) in SSM 116. See the site for complete list of locations .